10. Hatsune Miku: Project DIVA Future Tone Everyone’s favorite teal-haired Vocaloid is back on the PlayStation 4. This PS4 port of the arcade game with the same name offers a redefined DIVA experience with Hatsune Miku. The game comes in various versions including the Prelude, Future Sound and Colorful Tone. Enjoy the infinite world of Miku and play through the game’s beats with over 220 songs. But you might have to buy the packs first. 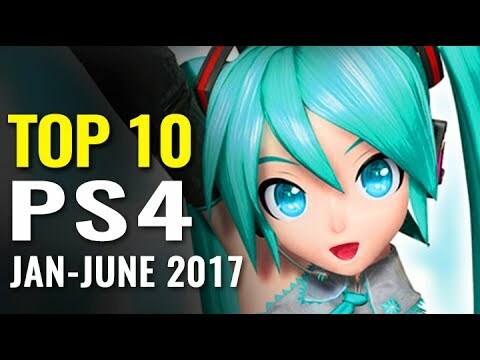 The game has songs that has spanned over its previous titles, making it the biggest Hatsune Miku game to release on the PlayStation 4. It includes songs from PlayStation Portable’s version which was never released outside Japan and the F series from the PlayStation 3 and PlayStation Vita. Colorful Tone is also another edition and it comes with songs from the Project DIVA Arcade series. There’s just so much Project DIVA games it’s confusing us. Fans of the franchise will definitely love this entry. Customize your Vocaloid with wigs, dresses and more. Make her beautiful inside and out, and the rest is up to you. Released on January 2017, this game receives a PlayScore of 8.80. 9. Tekken 7 NAMCO Bandai’s best-selling fighting franchise is on its 9th entry. Tekken 7 is the biggest and baddest Tekken game to date. With the tagline, “The best fights are personal”, experience the true story behind the Mishima Feud with its single player story. These family issues are getting out of hand. Experience Tekken like never before with the integration of the Unreal Engine 4. Show your insane combo’s and perform powerful punches with photorealistic visuals. Pick from a wide variety of characters from the Tekken universe including new ones like Filipino Josie Rizal, Arabian Shaheen and a female version of Raven. These heroes offer different style of combat, making every battle different. Additionally, the game features new mechanics called “Rage Art” and “Rage Drive”, this enables players to unleash a special attack to their opponent when low on health. It’s a game-changing alteration and it definitely adds to the challenge. Critics and gamers loved the game’s loyalty to the game’s combat and quirkiness. Calling it the “BEST” Tekken game to date. Recently released this June 2017, it has a PlayScore of 8. Gravity Rush 2 Return to the life of Kat in another mind-bending adventure from SIE Japan Studio. After the events of the first game, Kat meets up with her friend Raven and together they go to the floating city of Hekseville. A land sprawling with simple delights, beautiful colors and a new threat. A strange gravity phenomenon has happened and it’s up to Kat and friends to save it. This sequel offers more space-bending gameplay to the gable. Just like its original, Kat can float around the air with her insane gravity powers. But that was just one! This time, Kat can change into three different modes: Kat’s normal Gravity power, Lunar and Jupiter. Lunar deals with light movements, making Kat faster while Jupiter deals out the heaviest damage but slower compared to the two. Critics and gamers loved Kat’s personality. Making her the center of attraction in all Gravity Rush games. Released this January 2017, it has a PlayScore of 7. Nioh Who says Japan was always about cute 2D girls and adorable dogs? Based on Akira Kurosawa’s unfinished script, follow the Western warrior William as he pursues his target in a thirst for vengeance. Travel to Japan’s dark fantasy version of the Sengoku Period. Face off Yokai infested creatures and Emperors and survive the Land of the Rising Sun. The game offers an intense amount of story for all things Japan. Step inside haunted temples, creepy Japanese fields and encounter the deadliest mythical creatures in Japan. Use William’s wide array of combat skills such as stances. These stances change the pace of battle, making you counter every enemy with a flick of a button. Master its fluid fighting style, and walk through a dark and demented Japan with ease. Critics loved the game’s combat, it’s somewhat reminiscent to the Soul’s series. Aside from that, the story is something looking forward to. Released this February 2017, the game has a PlayScore of 6. Night In The Woods An Indie game rocking PlayStation’s store. This side-scrolling adventure deals with a thoughtful and mature theme that echoes into your mind once the credits roll. Follow Mae as she drops out of college to find meaning and purpose on her life. She returns to her lovely hometown and notices something different. Something is in the woods. Get entranced with the game’s exceptional writing and clever humor. It’s a story-driven game propelled with beautiful character development and rewarding exploration. Talk to people, meet new friends, and get lost into a night in the woods. After a successful Kickstarter campaign, it was finally released during February 23rd, and it receives a PlayScore of 5. What Remains Of Edith Finch A game all about uncovering the mysterious disappearance of your family members. Set in a haunted Washington Estate, follow Edith Finch in her quest to find the truth in a collection of short stories that weaves in a puzzle-like experience. Powered with the Unreal Engine 4, experience realistic visuals in first-person perspective. The story deals with the concept of death in the most alluring ways, if not haunting. Find out why she’s the last Finch alive, and set yourself free from the truth. Everyone loves the game’s design. They praised the game’s rich story, design and oddity that resonates throughout Giant Sparrow’s offices. Looks like they really did a good job after The Unfinished Swan. The game was released on April 25th, and it has a PlayScore of 4. Injustice 2 2017 is a great year for fighting games and what could be more enjoyable than a group of superpowered creatures vying for supremacy? NetheRealm Studios’ superhero powered fighting game is blowing up with more fantastic heroes to play, more features to enjoy and a whole new story to get into. New heroes are introduced including Supergirl, Red Hood, Captain Cold, Brainiac and more. Together they fight in a superhero skirmish that determines the fate of the world. In this sequel, equip your favorite heroes with the game’s new feature called “Gear System”. This enables you to customize your heroes from top to bottom with stat building powerups and armor. Play with a friend and see who beats who. Recreate your favorite fantasy plays in more ways than one. If not for its narrative, complex combat and visuals, it would look like an ordinary game. It was released this May 16, and it receives a PlayScore of 3. NieR: Automata Yoko Taro’s gift to mankind is a hot Android with a tight loli-dress. Kidding aside, this action-RPG is a spin-off to the Drakengard series. Although the lore is hidden deep beneath some subtle moments, the game doesn’t necessarily require you to play the first games. Follow 2B, 9S and A2. A group of Android units designed to protect Humanity after an Alien Race conquers Earth. These YoRHa Units seek out missions and find leads to find the cause of mysterious happenings in the planet. Unleash your badass moves with Platinum Games’ signature hack and slash action. 2B, 9S and A2’s insane movements dazzle the players in every possible way. Uncover the deep and complex story hidden beneath its 26 different endings. Yes, you heard that right, 26. Some are weird, some are downright stupid. But the main ones might leave a pang on your heart. Released this March 7 and considered as a GOTY contender, this game has a PlayScore of 2. Horizon Zero Dawn Guerilla Games’ entry to SONY’s long list of exclusives is oozing with robotic dinosaurs and futuristic wildlife. Set after the events of a Global Extinction where humanity ceases to function in a society, follow Aloy in her quest to find out the reason for mankind’s downfall. With its open-world design, set your sights in the game’s beautiful landscapes. Use Aloy’s makeshift tribal weapons to create arrows and spears… all built to fend off these mechanical mayhem. Survival is key so upgrade her using the game’s comprehensive Skill Tree. The third-person action gameplay is open for slick action sequences when against huge beasts. It was Guerilla Games’ latest IP since Killzone and boy they succeeded. It won the hearts of fans and critics due to its beautiful open-world design, fast gameplay and captivating story. It was released during February 2017, and it has a PlayScore of Here are the Runners-Up before we reveal the #1. 11. Yakuza 0. Experience the Origin story of the Yakuza series in SEGA’s rich open-world action-adventure. It has a PlayScore of 12. Full Throttle Remastered. Revisit the classic LucasArts point and click adventure with high definition upgrade and some surprising new content. It has a PlayScore of 13. Resident Evil 7. Horror makes a return in CAPCOM’s latest entry to the RE franchise. Follow a man finding his missing wife in a creepy mansion in Dulvey, Louisiana. What could go wrong? It has a PlayScore of 14. Danganronpa 1-2 Reload. A combination of the first and second Danganronpa games on the PlayStation Vita. It has enhanced visuals and more added content. It has a PlayScore of 15. Little Nightmares. A side-scrolling puzzle adventure. Guide Six in her escape from a twisted world of The Maw. Be careful. It has a PlayScore of 16. MLB The Show 17’. Experience the joy of Americans in this latest entry to the MLB franchise. It comes with enhanced features, new content and sweet new modes. It has a PlayScore of 17. Tales Of Berseria. The latest entry from Bandai Namco’s JRPG’s Tales series tells the tale of Velvet Crowe and friends in their journey to save their world from evil. It has a PlayScore of 18. Wonder Boy: The Dragon’s Trap. Follow the cursed adventures of a Half-Boy, Half-Lizard as he escapes from the fabled Monster Land. It has a PlayScore of 19. Loco Roco: Remastered. Return to the classic singing Loco Roco’s as they roll out to the PlayStation 4 with enhanced graphics and added content. It has a PlayScore of 20. Polybious. A mysterious game coming from an internet urban legend. Now debunked, explore a digital cyberspace creeping with mystery. It has a PlayScore of 1. And the best PlayStation 4 game this during the first quarter of 2017 is none other than Persona 5! ATLUS’ award-winning series is back for more. This time, follow a group of notorious Phantom Thieves as they shape the future of society by stealing corrupted people’s hearts. Be a regular high schooler by day, and a thief at night. Provided if Morgana doesn’t want you to go out. Just like its predecessors, take control of your dual life by participating in classes during daytime and talking to friends. You can watch movies, go on a date with Makoto or do baseball in its lifelike recreation of modern day Tokyo. At nighttime, call your friends and prepare for the most amazing heist the metaverse has ever known. A massive success, Persona 5 dominates PlayStation 4’s charts with its amazing story, jazzy soundtrack and memorable characters. What could be more fun than a talking cat that forces you to sleep? Released on April 4th after delays and delays, it finally arrived and it has a PlayScore of .